RTV Bangla is now featured in YuppTV to entertain the audience with its quality and unbiased content. It updates them with prompt and timely news, no matter from which corner of the world they watch the channel. RTV Bangla Live which is available round the clock, is mainly a satellite television channel that streams informative world wide events and keeps its viewers informed about the current happenings across the globe, in an accurate manner. 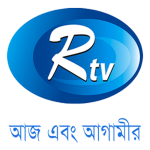 RTV Bangla Live broadcasts a number of quality programs and promotes a wide variety of channels from Bangladesh. They feature a plenty of talk shows, cartoons like Thomas and Friends, serials, movies in various languages and melodious music that is available at particular hours, like Unplug Live Music, to entertain its viewers with great shows. Also, contents on fashion and health to improvise the normal lives of the people are broadcast on RTV Bangla channel. Live commentary on national and international affairs, current happenings across Bangladesh and live shows are other top content provided for its audience.It is a top informative portal that features daily news, news about entertainment and media, the political and economic affairs across the globe and also, makes the information accurate with live videos and pictures.Sports news and religious content are the other highlights of RTV Bangla Live.